08:46 Hello, good morning and welcome to AUTOSPORT Live's Italian Grand Prix coverage, with the beginning of Monza's final practice session just moments away. 08:49 Yesterday's sessions were fascinating, with a continuation of the battle between Nico Rosberg and Lewis Hamilton at Mercedes at the top of the times. However, we also saw McLaren in the mix, and Williams post some mighty long-run times in the afternoon. Red Bull and Ferrari aren't out of the picture either. And we should get some answers in the next 60 minutes as teams prepare for the all-important qualifying session that follows later. 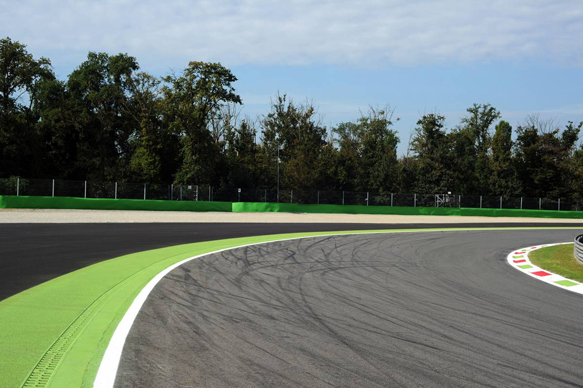 08:54 It's a beautiful morning here in Monza, with an air temperature of 21C and a track temp of 25C. Just a gentle breeze to rustle the leaves of the royal park's famous trees. 08:59 Hamilton will be using a different engine today from that he used on Friday, which was his fire-damaged Hungary unit. Remember, he lost an hour of that second practice session with an electrical issue, so will be keen to make up for lost time. 09:00 And we're off. Kvyat and Bottas are early takers. 09:00 Chilton joins them on track, along with Vergne and Maldonado. 09:02 Maldonado had a shocking Friday, as did Lotus team-mate Grosjean. They were off-track so much, you could play Lotus bingo if you like. Shout "house" every time you see one going up an escape road. 09:02 Kvyat and Bottas are already back in. 09:02 Grosjean, Gutierrez, Massa, Sutil and Bianchi are also on their installation laps. 09:03 F1 returnee Kobayashi also joins in, along with Alonso (insert Tifosi cheer here). 09:03 Ericsson and Magnussen are on track too. 09:04 Here's the first Mercedes: it's Rosberg. He performs a practice start at the end of the pitlane. Raikkonen is also circulating, along with Button. 09:05 Kobayashi is going for a second lap. 09:05 "How many laps on this run again?" asks Rosberg. He's told that he needs to do eight laps on his first run this morning. 09:06 Kobayashi records the first lap time, a 1m33.344s. 09:07 Magnussen goes P1, with a 1m32.296s, despite reporting a brake issue. 09:07 Button tops his McLaren team-mate on a 1m30.913s. 09:08 Kobayashi retakes top spot with a 1m30.612s. Take that McLaren! 09:08 Ericsson beats him on 1m30.523s. It's a Caterham 1-2! 09:09 Sanity is restored as Button goes 3.447s quicker than Ericsson. Phew. 09:10 Kobayashi works down to a 1m29.955s, he's marginally up on Ericsson in P2. 09:10 Hamilton has joined the track for his installation lap. 09:10 Both Red Bulls are also circulating now. 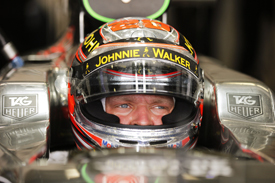 09:10 Hulkenberg goes second fastest for Force India, 1.2s slower than Button's best time. 09:12 Button is flying, lighting up the timing screen with three purple sectors. His best time now is 1m26.845s. 09:12 Hamilton goes third fastest on 1m29.297s. 09:13 Our man EDD STRAW is currently at Ascari and reports: "At Ascari, a corner called a chicane but which is quicker than usual corner of its type. "Can immediately see how difficult it is for the Caterhams to turn in, having to have a few bites of the wheel as the low downforce rear wing doesn't offer the necessary stability." 09:14 Perez pops into P2 on 1m27.709s, before team-mate Hulkenberg takes the place back with 1m27.219s. 09:14 Vergne goes P4 on 1m28.427s. 09:14 Vettel takes P3 with 1m27.362s, before Ricciardo goes P2 on 1m27.100s. 09:15 Fifteen minutes in and the order is: Button, Ricciardo, Hulkenberg, Vettel, Perez and Vergne. 09:16 "Force Indias look good through Ascari," says EDD STRAW. "Both Perez and Hulkenberg can turn in confidently and carry the speed through there well. Hulkenberg looks stronger as Perez seems to struggle a bit with the rear in the right-hander of the left-right-left combo." 09:16 All these times are being set on the hard tyre, of course. We'll see the faster medium tyre later, which is about 0.6s quicker around this circuit. 09:16 Kvyat goes P5 on 1m27.572s. 09:17 "Any improvements you can see?" asks Ricciardo. "Turn 6 apex speed," comes the reply from his engineer. 09:17 Bottas goes second fastest to Button on 1m26.915s. Two purple sectors for the Williams man, but he's not quick enough in the first sector. 09:18 Vergne takes to the escape road at the first chicane after locking up. He's currently ninth at the moment. 09:18 Massa is now P4 on 1m27.076s. 09:19 Both Ferraris are now on track, let's see what they've got on home turf. 09:19 Bottas sets a fastest first sector, that was where he was missing out on speed as opposed to Button. 09:19 Raikkonen's opening gambit is only P17. 09:20 Bottas takes the top spot, lowering the benchmark to 1m26.693s. 09:20 More EDD STRAW observations: "Bottas very attacking in the Williams. Car is moving around but looks very controllable and not costing him momentum. "Force India is less impressive when they take too much kerb. Probably a consequence of having to run the car stiffer than they would ideally like because of how narrow the car's setup window can be." 09:21 Alonso goes P4 on 1m27.065s. 09:22 Massa goes P2 on 1m26.790s. That's a Williams 1-2. 09:22 "No problems with turn in responsiveness for Raikkonen here at Ascari," says EDD STRAW. "His Ferrari is looking sharp." 09:23 Track temperature has rocketed to 33C in these sunny conditions. Air temp is 22C. Lovely. 09:23 Alonso sets a fastest second sector time. 09:23 Massa is told: "OK, we need to find some time braking into the second chicane and braking into Ascari. Switch override off." 09:24 Alonso equals Bottas's fastest time! 09:24 Bottas retains P1, thanks to setting his 1m26.693s earlier than Alonso. Sounds like the Tifosi enjoyed that. 09:25 Raikkonen has risen to P5 on 1m27.004s. 09:26 Rosberg has only completed three laps in this session after his earlier moans about brake temperatures and gearbox issues. He is yet to post a time, as is Sutil. 09:27 Rosberg is out of the session with his gearbox problem. That's going to be a big miss for him going into qualifying. 09:28 Grosjean goes P17. Lotus is going to struggle to get out of Q1 today. Maldonado is P14, just a tenth clear of Bianchi. 09:30 Force India is having a good session on these tyres today, Hulkenberg is sixth and Perez is P8. 09:30 Commentators curse! Perez stops. 09:31 Perez has come to a halt on the inside of Curva Grande. 09:33 Practice pacesetter Bottas has rejoined the session. 09:34 Button is on a quick lap, a new personal best in sector one now Perez's car is behind the barriers. 09:35 Button's 0.03s up on Bottas's quickest time at the second split. 09:35 Button sets a new mark of 1m26.573s. 09:35 "Rear brakes on for Grosjean as he turns into Ascari," says EDD STRAW. "He has to get completely out of it to avoid a spin. His Lotus is offering him no grip this morning." "McLaren looks reasonable in the entry and exit of Ascari but very difficult in the middle. Lots of steering corrections going on as the rear is misbehaving." 09:36 Almost immediately topped by Hamilton on 1m25.742s. That's still on the hard tyre, and eight tenths quicker than everyone else. 09:36 Ricciardo goes P5 on 1m26.729s. 09:37 Vettel goes P7 despite complaining of his MGU-K "misbehaving". 09:38 Chilton improves to P17, just a tenth behind Bianchi. The Caterhams are much closer to the Marussias today. 09:39 Maldonado improves his time, and is P15. He's a second behind Gutierrez's Sauber, however. 09:39 Ricciardo's engineer asks: "How's the balance?" The Aussie reports that it is OK, but he just encountered a "harsh up-shift." 09:39 Alonso has joined the track on the medium tyre. 09:40 Hamilton sets a fastest first sector, before Alonso hits the timing beam even quicker. 09:40 Hamilton reports that his brakes "don't feel like they're working too well," and that the "DRS is broken." 09:40 The Tifosi is on the edge of their seat. Alonso is only 0.03s up on Hamilton in sector two. 09:41 Alonso goes P2. Not much cheering there then. The Ferrari is slower on the medium tyre than the Merc on the hard. 09:42 Chilton jumps two places to P16. A tidy lap to beat Bianchi's best time by 0.01s. 09:42 EDD STRAW reports: "Bottas a bit over aggressive. He took a massive amount of kerb at the first apex and set the car bouncing. Meant he had a scruffy run through the middle and ran wide at the exit of Ascari. "But, still carrying respectable speed - Williams clearly giving him confidence. 09:43 Alonso is going again on his medium tyres. 09:43 Not a great first sector, however, for Alonso. 09:44 "Alonso right on the limit under braking at Ascari on his quick lap," says EDD STRAW. "Carried good speed in, but the car was a bit squirmy in the middle of the corner." 09:44 Alonso aborts, having been 0.3s off the pace at the second split. 09:44 Raikkonen goes P3 on the medium tyre, a 1m26.327s. He's four tenths off Alonso too. 09:46 Alonso, on the medium, is six tenths up on Button's hard-tyre time. We think the gap between the medium and hard is six-tenths of a second. You might wish to extrapolate that Ferrari and McLaren will be equally matched this afternoon. 09:47 Only two cars on track at the moment, and one of those is a Sauber. Talk amongst yourselves, but it will get a lot more exciting soon, we promise. 09:47 Hulkenberg is the next to switch to the medium tyre. 09:47 "Raikkonen a bit less impressive on the brakes at Ascari, but excellent mid-corner," says our man EDD STRAW. "Rear end wobble at the exit cost him a little time on his quick lap, though." 09:48 Raikkonen's second flying lap on the medium tyre there was just like Alonso's: underwhelming. 09:49 Poor first sector from Hulkenberg. He's 0.453s down at the second sector, which is a personal best. 09:49 Hulkenberg goes P9 on 1m26.923s. Not a big gain on the softer of the tyre compounds for the Force India, but we've seen that before. 09:50 The McLarens join the circuit on the medium tyres. Remember Magnussen has lost time in this session with a brake problem. 09:51 Ricciardo is the next frontrunner to open a lap on the medium rubber. Let's see what the Red Bull's got in the tank today. 09:51 Hamilton is on track again, this time on the medium. 09:52 Hulkenberg goes P5 on his second flying lap on the medium, a 1m26.608s. 09:53 Ricciardo goes P4 with a 1m26.482s. 09:53 Button rises to P3 on his first medium-tyred lap, a 1m26.294s. 09:54 Hamilton only manages a 1m25.745s, which is 0.003s slower than his hard-tyre time. A surprising development. 09:54 Massa sets a fastest first sector time. 09:55 Bottas goes P3 on 1m26.090s. 09:55 Massa is up on Hamilton's time at sector two. 09:55 Massa goes P4 on 1m26.114s. Not a great final sector. 09:56 "How's the balance?" asks Ricciardo's engineer. "I'm struggling with the rear in low speed and couldn't quite make much of the first sector," replies the Aussie. 09:56 Button improves his time but stays P5. 09:57 Kvyat goes P9. Magnussen to P10. 09:57 Bottas fails to improve his time by 0.001s. Consistent. 09:58 Vettel jumps up to sixth on 1m26.290s. He always goes well around here. 09:58 Hamilton sets a new best time in the second sector. 09:58 Hamilton is unhappy with his brakes: "These brakes aren't very good man." He is told that his brake temperatures are good, but he needs to work on the fronts a bit more. 09:58 Button sets a new fastest first sector time. 09:59 Hamilton improves his time by 0.223s, the best time now 1m25.519s. 10:00 Kvyat improves to eighth on 1m26.437s. 10:00 Button binned that lap on which he set the fastest first sector. These medium tyres seem very durable, wonder if we'll see some multiple efforts on them later? 10:01 The session is over with Hamilton's Mercedes leading the way as expected. 10:02 Ferrari is next up, with Alonso six tenths down on Hamilton. Bottas and Massa have given Williams a big boost going into qualifying, with Button and Vettel right in the mix too. 10:03 Rosberg's gearbox issue, which appeared to be his electronics refusing to 'learn' the gears, meant he didn't complete a timed lap in that session. He's on the back foot going into qualifying. 10:04 One final shock in that session: Kobayashi outpaced Grosjean and Chilton, as well as Ericsson. He was less than a tenth off Maldonado too, so Q1 could be quite tasty. 10:07 Perez was down in 13th after a gearbox problem curtailed his running. Might that lead to a grid penalty if it needs to be changed? 10:08 Paddy Lowe says Mercedes is changing parts that it is "permitted to change" and doesn't expect a grid penalty for Rosberg. 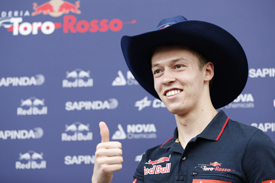 10:09 At Toro Rosso, Kvyat ended that session over a second clear of Vergne. Quite remarkable. 10:10 Watching a replay of Hamilton's fastest lap, he had plenty of oversteer to cope with in his trimmed-out downforce levels. Lovely stuff. 10:11 Does what happened in FP3 affect your predictions for the Italian GP result? There's a Sony PS4 up for grabs in the Castrol Grand Prix Predictor this weekend, and you can make your picks until five minutes before qualifying today. 10:12 Anthony Hamilton, Lewis's father, says his son is in "a really good space" this weekend. Looks like Team Hamilton is buoyant ahead of qualifying. 10:15 One of the key battles this weekend, bearing in mind what's at stake with future race seats at risk, is at McLaren. Button was P5 in that session, and looked really strong, whereas a brake-affected Magnussen was P11, six tenths down. 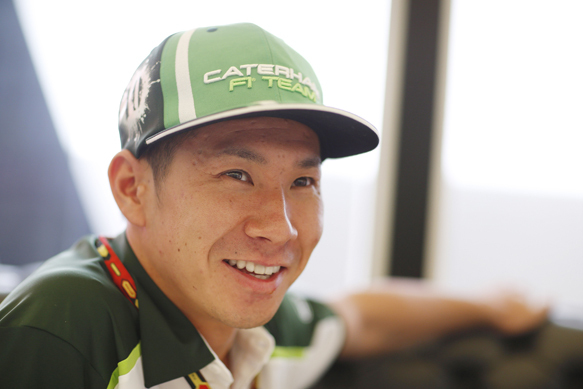 10:17 At Caterham, Kobayashi fans of the world will be in raptures as he outpaced Ericsson by almost a second. A mighty return. 10:18 Here's our comprehensive report from FP3, with Hamilton beating Alonso to the top spot in the final practice session at the Italian Grand Prix. Times and lap counts included. 10:18 We will be back for qualifying this afternoon, which kicks off at 1.00pm UK time. See you then. 11:45 Welcome back to our live coverage of the Italian Grand Prix at Monza's shrine of speed, the Mecca of momentum and, er, temple of terminal velocity. It’s qualifying o’clock and we’re all set for the latest installment of the Mercedes intra-team battle. 11:49 What have we learnt from four hours of practice so far this weekend? As usual, Merc has its usual stranglehold on proceedings. But it hasn’t been plain sailing, however. 11:50 Lewis Hamilton lost an hour on Friday with an electronics problem that prevented his engine from starting. This morning, however, it was Nico Rosberg’s turn to suffer gremlins. His gearbox's electronics refused to ‘learn’ the gears, which is crucial to its seamless-shift system and he didn't record a laptime. 11:51 Meanwhile Ferrari, on its home turf, looked in decent shape this morning as Fernando Alonso set the second fastest time, while McLaren’s Jenson Button has shown flashes of form all weekend. But perhaps the biggest threat to Mercedes is Williams, which is showing Red Bull Ring-style form this weekend. 11:54 Also in Ferrari-related news, Luca di Montezemolo has discounted the recent rumours that he's about to step down after an impromptu press conference on the steps of the Ferrari motorhome. 11:55 Be sure not to miss the action from the opening session; Q1 is going to be a stressful experience for Lotus as it looks highly likely to lose both its cars at the first hurdle. We're five minutes away from the start of the session. 11:56 Air temperature is 25C, track temp is up to 44C. 11:59 Hamilton gets a pre-qualifying inspirational man-hug from his father. Rosberg was recently filmed doing some kind of getting-in-the-zone bouncing around at the back of the Mercedes truck. 12:00 And the opening 18-minute Q1 session is go. There is only about six tenths of a second between the pace of the hard and medium tyre, so expect many of the frontrunners to try and save a set of the mediums for Q2. 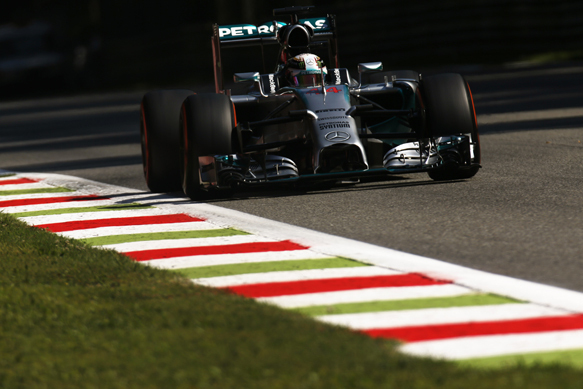 However, the gaps at Monza are usually much closer than the majority of circuits. 12:00 The race control computer has looked up at the sky and confirmed that the chance of rain is officially zero per cent for this session. 12:00 Bianchi, Chilton and Kobayashi enter the track. 12:01 They are joined by Hulkenberg, Perez and Ericsson. Now Rosberg joins in, keen to make up for his lost time in practice. 12:01 Nine cars on track straight away. Looks like the Marussias might try and tow each other. 12:01 BEN ANDERSON: "Kamui Kobayashi might not be too chuffed with the driver merry-go-round at Caterham right now, but the Japanese driver is certainly pleased to be back in the car this weekend. "After Budapest to be back in the car, to be back at Monza after two years, it takes a while for myself to get familiar with the car and track," Kobayashi said. "But in the end we've made a good step and I’m pretty happy. It's good [with the team]. We know how we work and we know what we need to do. It was no problem to get in the car and communicate." 12:02 Kobayashi opens his flying lap, as the Marussias both pitted. 12:03 Kobayashi had to pass a Toro Rosso on that lap, and on the medium tyres he records a 1m28.299s. 12:03 Perez goes P2 on 1m28.426s. 12:03 The hard Pirellis are the tyre of choice for the first runs for most. But as usual, those in uncompetitive machinery have gone out on the mediums, with both Caterhams using the faster tyre, along with Maldonado in the Lotus. 12:03 Ericsson is P3 on 1m29.165s, but is demoted by Hulkenberg. 12:04 Rosberg records a gentle 1m26.725s. 12:04 Vergne goes top on 1m27.516s. He's using the hard tyre. 12:05 Kvyat takes over on 1m26.734s. 12:05 Tip for Maldonado from Lotus: "OK Pastor, Hamilton is going to do a timed lap on the next lap, so he's a good car to follow." 12:05 Alonso sets a new fastest time in Q1, a 1m26.514s. 12:05 Rosberg raises the bar to 1m25.862s. 12:06 Hamilton goes P1 on 1m25.571s. Again, he's on the hard tyre, as is Massa who goes P2 on 1m25.607s. 12:07 Massa set the fastest time in the final sector. Williams is going to be a big force today. 12:07 Work is still ongoing on the other Lotus of Romain Grosjean in the garage. He doesn't need to have technical issues on top of the car's wild handling. 12:07 Button and Magnussen have both posted gentle opening flying laps. 12:08 Perez up to P6 on 1m26.868s. 12:08 Kvyat has a huge lock-up into the Rettifilo, but hooks the Toro Rosso around the corner without missing the chicane. 12:08 Rosberg P3 now on 1m25.862s. 12:08 Magnussen goes P4 on 1m26.337s. 12:08 Ricciardo is advised by Red Bull to "make a bit more space" as his "track position is good at the moment". 12:08 Massa sets the fastest first sector. Bottas goes P4. 12:09 Hamilton fails to improve his time by 0.016s. 12:09 Massa goes fastest, toppling Mercedes from the top spot, on 1m25.528s. 12:10 It's Williams, Mercedes, Mercedes, Williams at the moment. McLaren is the best of the rest. 12:10 Rosberg takes over at the top on a 1m25.493s. 12:10 Hamilton's not happy with himself: "That was a pretty shocking lap". 12:11 In the drop zone, it's Grosjean's stricken Lotus plus the Caterhams and Marussias and Sutil's Sauber. 12:11 Rosberg wasn't pleased with his first run either, though, discussing with Mercedes how many slow laps to do before trying again. 12:12 Button goes P5 on 1m26.328s. 12:12 Hamilton retakes the top spot on 1m25.363s. 12:12 We're back to a Mercedes 1-2, with Williams 3-4. 12:13 Grosjean joins the party at last after that fluid leak. He's straight of medium tyres, obviously. 12:14 In on-the-bubble land, Maldonado has just a tenth in hand over Bianchi. It's all to play for down there. 12:14 Sutil and Grosjean are on track as they attempt to escape the drop zone. 12:15 Vergne is probably safe in P14, as he's got half a second over those who are struggling near the bottom. 12:16 Sutil improves to 16th, putting Maldonado into the drop zone. 12:16 Grosjean's first effort is 19th, a tenth off Maldonado. 12:16 Vergne improves to P5. 12:16 "Abort the lap, abort the lap," declares Kvyat with some urgency. Toro Rosso tells him to keep tyres and brakes warm to try again. 12:17 Maldonado improves his time from a 27.657 to 27.520, but it's not enough. 12:17 Lotus recommends Grosjean should try to get a tow from Bianchi on his last bid. 12:17 Sutil's lap put him half a second clear of the drop-zone battle. It looks like it's all over for Lotus. 12:18 Grosjean is three tenths outside of where he needs to be by the first split time alone. 12:18 Kvyat slots into P6. 12:18 Gearbox problem for Maldonado, Lotus tells him not to change gear any more. 12:18 Maldonado pits, he is out. 12:19 Grosjean improves his time, jumping Bianchi on a 1m27.632s. 12:19 Kobayashi jumps ahead of both Marussias with a 1m27.671s. Nice one. 12:23 Massa was fastest in the first sector in that session, with Hamilton bossing the other two. That was on the hard tyre, let's see what happens next on the mediums. 12:24 A congratulatory pat on the shoulder for Kobayashi from Caterham team boss Christijan Albers after he lifted the green car onto the penultimate row. 12:24 Hamilton had a buffer of 0.13s over Rosberg in Q1. Third placed Massa was 0.165s down on the fastest time. 12:25 And Q2 is go. 12:25 Hulkenberg is our first taker for Force India. 12:26 Kvyat was seventh quickest in Q1, but remember he's carrying a 10-place penalty for a gearbox change. 12:27 Hulkenberg opens his flying lap, as Kvyat joins the fray. 12:27 Sutil also on track now, along with Rosberg and Gutierrez. 12:28 Rosberg is straight onto the softer tyre, which this weekend is the medium, as you'd expect. 12:28 The first flying lap of the session is in the book by Hulkenberg, a sedate 1m31.488s. 12:29 "Don't increase the rear temps any more than now, temperature's looking good," is the message for Hulkenberg. 12:29 Kvyat is 1.7s up on Hulkenberg's first split. 12:29 Ferrari tells Alonso he has two laps available but to go for it in the first timed lap. It also says a lot of things (secrets?) in Italian. 12:29 Hulkenberg improves to a 1m26.279s. 12:30 Kvyat goes top on a 1m26.205s. 12:30 Rosberg goes P1 on 1m24.682s. Rapid! 12:31 Bottas goes P2 on 1m24.882s. This is a lot faster than we've seen on this tyre all weekend. 12:31 Massa goes P3 on 1m25.046s. Alonso is P4 after a wiggle at Parabolica. 12:32 Two tenths exactly between Rosberg and Bottas. 12:32 Mercedes and Rosberg debate their run plan over the radio, before agreeing it's better discussed in the garage. 12:32 Vergne goes P8, just 0.003s behind Kvyat. 12:33 "Isn't it unnecessary to take the risk of just one timed [lap]," Rosberg had asked. But Mercedes was worried about him being out of position in traffic if he did two. 12:34 Hamilton on a quick lap, setting the fastest middle sector. 12:34 Vettel and Ricciardo go P6 and P7. 12:34 Hamilton sets the fastest lap of the weekend, a 1m24.560s. 12:34 Button takes sixth, just behind Alonso and ahead of Perez. 12:36 Sixth tenths between Alonso in P5 and Raikkonen in P11. 12:36 In the drop zone right now are Magnussen, who has just chased Hamilton back to the pits, along with Kvyat, Vergne, Hulkenberg, Gutierrez and Sutil. 12:37 At the moment, the time everyone in the drop zone is shooting at is Raikkonen's 1m26.110s. 12:37 Raikkonen has gone out early again. 12:38 Kimi definitely suffering trafficaphobia today. He wants clear air. 12:39 Raikkonen backs out of his first lap. The good thing is that these tyres have at least two laps in them. 12:39 All cars are now on track. 12:40 Lots of green first sectors from those in the drop zone, except for Magnussen. 12:40 Bottas improves but stays P3. 12:40 Sutil improves, but only to 15th. He's out. 12:40 Hulkenberg is out, P14. 12:41 Vergne is out, improving to 12th. 12:41 Magnussen knocks out Raikkonen! And Kvyat beats him too! 12:42 Gutierrez had a wild excursion onto the Ascari run-off on his final run. 12:42 Magnussen saves his skin with a last-gasp flyer, a tenth clear of Kvyat. Raikkonen was a bit scruffy, and might be ruing that first lap he aborted. 12:42 "We are so slow in the last part of the lap," complains Hulkenberg to Force India. 12:43 Raikkonen will start 11th, of course, as Kvyat's gearbox issues will promote him and another nine cars. He will be the first to get free tyre choice, but with the medium lasting so well this weekend, that's not much solace. 12:44 Hulkenberg was four tenths off team-mate Perez. That's an aeon around Monza. 12:46 Hamilton takes a 0.04s advantage over Rosberg into Q3. Don't blink, or you'll miss it. 12:47 The Mercs have two and a half tenths in their pockets over the Williamses. So it's a nailed-on Mercedes front row... Unless they collide. 12:47 Everyone who has made Q3 will have two sets of new medium-compound Pirellis available, save for Sergio Perez who just has one. 12:48 And Q3 is under way. No takers yet. 12:48 Perez is the first car on track. 12:50 Rosberg joins the fray as Perez opens his lap. 12:50 Bottas joins in too. 12:51 Massa the fourth car on track. Perez has to pass Rosberg on his flyer. 12:51 "Tyres and brakes on the cool side," Perez was warned as he heading towards this flyer. 12:51 Perez sets the first flying lap of 1m26.230s. 12:52 Rosberg sets a new fastest first sector. Ditto sector two. 12:53 Rosberg lowers the pole time to 1m24.552s. Game on. 12:53 Bottas goes P2 on 1m24.697s. 12:53 Hamilton is on a proper flyer here. 12:54 Hamilton takes pole, producing a lap of 1m24.109s. Sensational. 12:54 Button goes P5 behind the Williamses. 12:55 Vettel is sixth fastest, ahead of Alonso, Magnussen and Ricciardo. 12:55 Hamilton's engineer gives him the good news, and says he could find another tenth in sector one. "I'll give you an overlay," he promises. 12:56 Ricciardo thinks a tyre pressure change is needed after a messy first run. 12:57 Massa has to find a tenth and a half to beat Bottas to P3 on this last run. 12:57 All cars in the pits right now, but hell will be unleashed imminently. 12:57 Vettel, Bottas, Rosberg, Alonso all trickle out for the endgame. 12:58 Button is the last car to leave the pits. 12:58 "Don't pass the Williams," Rosberg is ordered, as Mercedes wants him in his own space. 12:58 Cars on their warm-up laps right now, and then it's an all-or-nothing bid for glory. 12:59 Rosberg does have Alonso fairly close behind him as they head for their final laps, though. Big tow for the Ferrari? 12:59 Vettel is the first to open a lap. 12:59 Rosberg sets the new fastest first sector. 13:00 Alonso is also up on his personal best. 13:00 Hamilton is slower than his best. 13:00 Rosberg improves his middle sector too. 13:00 Rosberg improves but stays second. 13:01 Massa doesn't improve and will start fourth. 13:01 Button improves but can't beat a flying time from Magnussen, who grabs P5. Wow. 13:02 Ricciardo improves but stays ninth, a tenth behind Vettel. Alonso is seventh. 13:02 Replays show a lock-up from Bottas at the Rettifilo as he began his last lap. 13:02 And another replay reveals that Ricciardo used plenty of Parabolica run-off on his last lap. 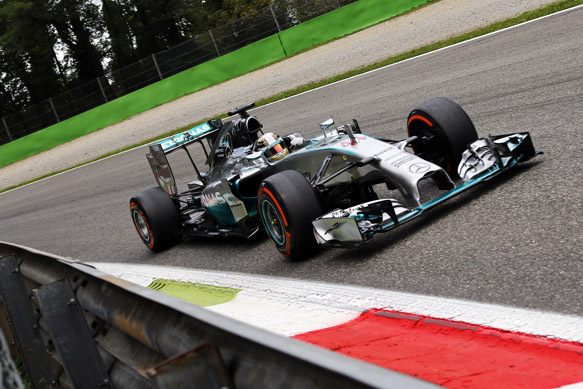 13:03 Hamilton's pole advantage was 0.274s. Easy in the end. 13:03 Hamilton gets Mercedes' congratulations but immediately asks "did anyone else improve?" and is told that Rosberg did a little. 13:03 That lap from Magnussen was the real star turn of the final moments. Remember he only just made it into Q3, and will now start fifth. 13:04 Mercedes reassures Rosberg that it was a decent effort considering he missed final practice. 13:05 "I'm looking forward to tomorrow," says third-placed Bottas. "I think we all are..." replies his engineer. 13:05 Williams might actually be disappointed that it ended up over half a second slower than the fastest Merc. Still, a second row lock-out will be celebrated, and rightly so. 13:06 And don't forget the race pace that Williams showed on Friday. Watch this space. 13:07 Rosberg appears to be more interested in collecting his helmet than congratulating Hamilton on pole position. 13:07 Hamilton and Rosberg studiously ignoring each other's presence in the post-qualifying formalities. 13:08 Rosberg had the small victory of the fastest first sector time, but Hamilton dominated in the second two. 13:08 The Mercedes drivers don't even look at each other as they pose for photographs after being weighed. 13:09 Two tenths in the second sector was Hamilton's big advantage over Rosberg, with another tenth in the final sector outweighing the time he lost in sector one. 13:26 It's an all-McLaren third row for tomorrow's race and Magnussen pipped team-mate Button in the dying moments of qualifying to claim fifth. The Dane was somewhat surprised by their performance today. "I didn't think our qualifying performance would be that good," he admitted. "Our race pace is quite good, so to start where we are is very good indeed." And does he think he'll be able to take on Mercedes and Williams tomorrow? "It's nice to have the power and hopefully we'll be able to challenge the others tomorrow. "We'll be fighting with Williams, even though they are some way in front of us, but we should give it a go and get some good points." 13:28 Alonso is rather pleased with his performance, the Spaniard again the best of the drivers without Mercedes power, but the Ferrari driver admits the race will not be easy. "I think the practice sessions went much better than we expected, so we arrived in qualifying with more optimism, but then when everybody uses the maximum power we lacked a bit of competitiveness. But it is what it is. "The two Mercedes, then the Williams, then the McLarens, and then a Ferrari, so it's good for me. "It's going to be a difficult race, but the good thing is that the times are very close, so it could be a group race and that could make it fun. We have to try to save the tyres as much as possible because the best strategy is one stop, so it's a lot of laps with both the softs and the hards." Team-mate Raikkonen says he is still hoping for a good result despite missing the cut to go into Q3. "The car was feeling a bit tricky and I made some mistakes because of that. "I'm going to try [to get points]. It's been a pretty good weekend apart from qualifying. Hopefully we can be strong tomorrow." 13:32 Here's EDD STRAW's full round-up of the events of qualifying, with Hamilton taking his first pole position in four months. 13:36 The Mercedes drivers have been commenting on the changes to the Parabolica in the post qualifying press conference. Hamilton feels it is safer to attack the corner but was quick to point out he had been respecting the track limits: "I think naturally you can take more risks, in the past it was a corner you had to build up to, you didn’t want to go into to the gravel. "Now you can attack it more but you know you have that cushion there, you can run wide and come back on. "I haven’t been anywhere near the green or white line. It is just a safer option in terms of stopping the car." Rosberg agrees that it has lost some of its allure but can still punish anybody who gets it wrong: "Of course it is a pity compared to what it used to be, but it was one of the most dangerous corners. "It works out really well because as soon as you put the tyres over the white line you lose grip, so it works really well." 13:40 Nico Rosberg refuses to describe his plan of attack in detail but reinforces that he is still free to race Hamilton: "The message is we are keeping on racing, every situation is different." He indicated the team management have been working hard to placate both Mercedes drivers after their strong comments post-race in Belgium: "Niki has apologised for that as well, which is great." "Monza is a special place for me, I really like Italy and all my friends are Italian, [it's] great to race here and race in front of the tifosi. I am thankful for that, and then at the moment, it doesn’t matter where we are. I am not thinking about the end of the season yet, I am trying to get the best out of it." 13:43 Cars are on the warm-up lap for round nine of the GP2 Series, with series leader Jolyon Palmer starting last after failing to have the sufficient fuel in his tank after qualifying to provide a sample. Stoffel Vandoorne starts from pole ahead of Arthur Pic and Mitch Evans. 13:45 Poleman Vandoorne leads from Pic, Evans and Richelmi. Marciello was slow away from fourth and is now 19th. 13:50 Vandoorne leads the GP2 feature race by 2s from Pic, Evans and Richelmi. Leal is fifth, with team-mate Nasr right behind. Palmer is 15th, helped by some Coletti-inspired chaos at Rettifilo on lap two. 13:57 In what seems an understatement after both him and team-mate Maldonado went out in Q1, Lotus man Grosjean says "it wasn't a perfect day today." But the Frenchman is at least proud of his team's efforts. "We always knew that the track layout would not suit us that well plus we had issues this morning with the intercooler and we changed it during the lunchtime break. "We knew that the results would be tough but I was really proud and happy to see that every single mechanic came over to help get my car ready after Pastor's car left the garage. This was a testament to the very strong team spirit from Enstone, even when the chips are against us." 13:59 Kobayashi starred in the battle of the tail-end Charlies today. 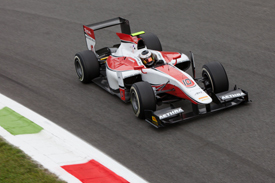 The Japanese driver beat Caterham team-mate Ericsson and both Marussias to claim 19th. "I'm very happy with today's qualifying result!" he said. "I didn't have much time in the car yesterday, but I think it has been a very good comeback. "We worked hard overnight to improve the car and we have ended up ahead of our competitors today. "I'm very confident for tomorrow - it will be a very challenging race, but we are looking strong." 14:02 In the GP2 feature race at Monza, Jolyon Palmer has risen from last to 10th in 10 laps. A very impressive outbraking move on Rio Haryanto at Rettifilo has been the highlight so far. 14:05 GP2 race leader Vandoorne has made his mandatory pitstop. Pic now leads, from Evans. 14:09 Half distance in the GP2 feature race. Marco Sorensen is the leader, but he has yet to make his mandatory pitstop. The real leader is eighth placed Vandoorne, ahead of Pic, Evans, Richelmi and early-stopping Abt, who has jumped Leal and Nasr. Palmer is running fourth, having started on the hard compound tyre. He will run very long into this race before stopping. 14:19 Kvyat will start tomorrow's race from 21st after being hit with a 10-place penalty for using his sixth power unit of the season. Still, it could have been worse - he could have carried the grid demotion over to tricky Singapore. "P11 is a good qualifying result in the end and I did all I could," he said. "It’s a shame that I won’t be starting from P11, but from P21. "On the positive side, we are not carrying this grid penalty over to Singapore, so I'm pleased about that. "It’s hard to say what we can do tomorrow, because starting from the back is never easy. We will look at what we can do with the strategy and I will give it my all to fight through the field to arrive as high up as possible." 14:20 Nine laps to go in the GP2 feature race, Vandoorne leads Pic by 1.1s, with Evans third. Points leader Palmer is 10th, but battling with his Nemesis of recent times, Cecotto. 14:22 Palmer grabs ninth from Leal. Now just one place to go to get reversed-grid pole for the sprint race, with seven laps to go. Coletti is his next target. 14:24 At the front, Pic has closed the gap to leader Vandoorne to under a second. Evans is a distant third. Palmer is a second behind Coletti in his quest for Sunday's pole. 14:27 Palmer has passed Coletti for eighth at the exit of Roggia, and that means reversed-grid pole for Sunday's race. 14:32 Vandoorne fends off a late attack from Pic to take victory by just 0.6s, with Evans a distant third. Richelmi finished fourth, ahead of Negrao, Nasr, Sorensen and the heroic Palmer. 14:36 Ericsson will start the race from the pitlane instead of 22nd for speeding under yellows in FP3 today. He has also been given three penalty points. Story coming soon. 14:41 AUTOSPORT Live will be back from 12.45pm UK time on Sunday morning. We'll have plenty more driver and team reaction to today's qualifying session both in our news section this afternoon and during tomorrow's F1 Live build-up.